Solid-sawn heavy timber members are predominantly employed as the main structural elements in post and beam construction. The term ‘heavy timber’ is used to describe solid sawn lumber which is 140 mm (5-1/2 in) or more in its smallest cross-sectional dimension. Large dimension timbers offer increased fire resistance compared to dimensional lumber and can be used to meet the heavy timber construction requirements outlined in the Part 3 of the National Building Code of Canada. Sawn timbers are produced in accordance with CSA O141 Softwood Lumber and graded in accordance with the NLGA Standard Grading Rules for Canadian Lumber. There are two categories of timbers; rectangular “Beams and Stringers” and square “Posts and Timbers”. Beams and Stringers, whose larger dimension exceeds its smaller dimension by more than 51 mm (2 in), are typically used as bending members, whereas, Posts and Timbers, whose larger dimension exceeds its smaller dimension by 51 mm (2 in) or less, are typically used as columns. Sawn timbers range in size from 140 to 394 mm (5-1/2 to 15-1/2 in). The most common sizes range from 140 x 140 mm (5-1/2 x 5-1/2 in) to 292 x 495 mm (11-1/2 x 19-1/2 in) in lengths of 5 to 9 m (16 to 30 ft). Sizes up to 394 x 394 mm (15-1/2 x 15-1/2 in) are generally available from Western Canada in the Douglas Fir-Larch and Hem-Fir species combinations. Timbers from the Spruce-Pine-Fir (S-P-F) and Northern species combinations are only available in smaller sizes. Timbers may be obtained in lengths up to 9.1 m (30 ft), but the availability of large size and long length timbers should always be confirmed with suppliers prior to specifying. 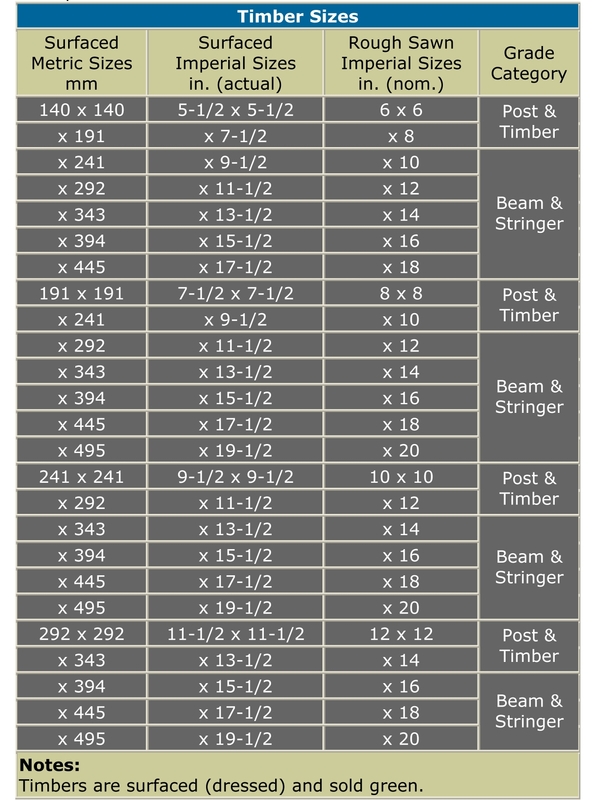 A table of available timber sizes is shown below. Both categories of timbers, Beams and Stringers, and Posts and Timbers, contain three stress grades: Select Structural, No.1, and No.2, and two non-stress grades (Standard and Utility). The stress grades are assigned design values for use as structural members. Non-stress grades have not been assigned design values. No.1 or No.2 are the most common grades specified for structural purposes. No.1 may contain varying amounts of Select Structural, depending on the manufacturer. Unlike Canadian dimension lumber, there is a difference between design values for No.1 and No.2 grades for timbers. Select Structural is specified when the highest quality appearance and strength are desired. The Standard and Utility grades have not been assigned design values. Timbers of these grades are permitted for use in specific applications of building codes where high strength is not important, such as blocking or short bracing. Cross cutting can affect the grade of timber in the Beams and Stringers category because the allowable size of knot varies along the length of the piece (a larger knot is allowed near the ends than in the middle). Timbers must be regraded if cross cut. Timbers are generally not grade marked (grade stamped) and a mill certificate can be obtained to certify the grade. The large size of timbers makes kiln drying impractical due to the drying stresses which would result from differential moisture contents between the interior and exterior of the timber. For this reason, timbers are usually dressed green (moisture content above 19 percent), and the moisture content of timber upon delivery will depend on the amount of air drying which has taken place. Like dimension lumber, timber begins to shrink when its moisture content falls below about 28 percent. Timbers exposed to the outdoors usually shrink from 1.8 to 2.6 percent in width and thickness, depending on the species. Timbers used indoors, where the air is often drier, experience greater shrinkage, in the range of 2.4 to 3.0 percent in width and thickness. Length change in either case is negligible. Allowances for anticipated shrinkage should be made in the design and construction. Shrinkage should also be considered when designing connections. Minor checks on the surface of a timber are common in both wet and dry service conditions. Consideration has been made for these surface checks in the establishment of specified design strengths. Checks in columns are not of structural importance unless the check develops into a through split that will divide the column.